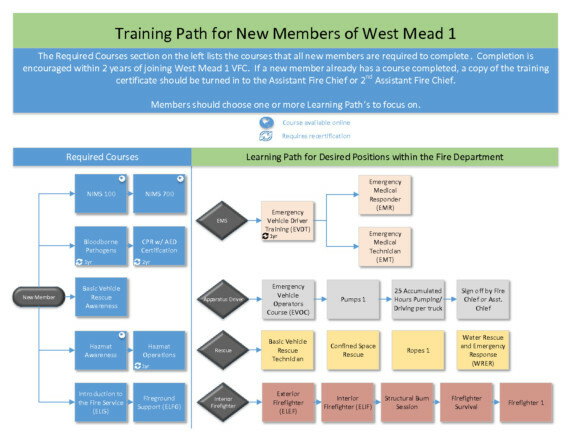 New members of West Mead 1 are expected to pursue weekly training with the fire company and complete some state-certified courses within their first two years of service. Some courses such as ICS-100 and IS-700 may be taken online. Other courses such as Bloodborne Pathogens and CPR with AED are provided on a regular basis for all members. Our training path flowchart shows all mandatory training with additional certifications for specific functions. IS-100.C is an interactive online course from FEMA providing an introduction to the Incident Command System. The course is available here: https://training.fema.gov/is/courseoverview.aspx?code=IS-100.c. The IS Program requires a FEMA SID. You can register for one at https://cdp.dhs.gov/femasid/register. NIMS IS-700.B is an interactive online course from FEMA providing an overview of the National Incident Management System (NIMS). The course is available here: https://training.fema.gov/is/courseoverview.aspx?code=IS-700.b. Bloodborne Pathogens teaches emergency responders how to protect themselves and others from being exposed to blood or blood-containing materials, and how to respond if they are exposed. This annual course meets OSHA requirements for bloodborne pathogens training. CPR with AED is an instructor-led course that teaches adult and child CPR and AED use, infant CPR, and how to relieve choking in adults, children, and infants. This certification must be renewed every two years. Basic Vehicle Rescue Awareness introduces first responders to a systematic approach to rescue, including hazard recognition and control, incident command, situational assessment, and personal protection in addition to the requisite tools, equipment, and techniques of vehicle rescue. HAZMAT Awareness for First Responders prepares first responders to recognize and identify hazardous materials by container and DOT/NFPA markings, and to prepare to respond to incidents involving hazardous materials while protecting themselves and others from exposure. This course is available online through TrainPA. A free TrainPA account is required. The course itself is located at https://www.train.org/pa/course/1050815/. HAZMAT Operations prepares first responders to participate in Hazardous Materials defensive or containment operations. An annual refresher is required. firefighter safety, personal protective equipment, tools and emergency lighting, and backing apparatus. These guidelines are provided for use by West Mead #1 Volunteer Fire Company. These virtual tours introduce you to the features and contents of our apparatus. Each engine compartment is identified along with its contents. Pump operators and firefighters should be familiar with the contents of each compartment. West Mead #1 VFC is not responsible for content on the training websites linked in this section. If you have questions about particular courses qualifying for certification, please check with an officer. View our selection of training videos on our Videos page.